Is the appeal really that difficult to comprehend? It seems that thousands of words have been written about the enigma of the “bronies,” loosely defined as fans of the latest incarnation of the My Little Pony franchise, Friendship is Magic, who are outside its target audience of young girls. The majority of bronies are male, and in their teens to late twenties. A great deal of puzzlement has been expressed over why such an odd — and specific — demographic would take notice of a series that would stereotypically feature an endless parade of little girls (or their equine counterparts) serving tea in tiny cups to stuffed animals. My Little Pony: Friendship is Magic takes place in the magical land (no really, that’s how it’s described in the first line of the first episode) of Equestria. Equestria is home to a wide range of animals and mythical creatures. Nearly every species is sapient, and the hoofed mammals (save for perhaps goats and swine), as well as creatures such as dragons and sea serpents, speak English (and some French). The ponies themselves are split into three types: Unicorns with magic powers; pegasi who can fly and walk on clouds; and wingless, hornless “earth ponies” who don’t need any pity because it’s rumored they have supernatural bonds with the natural world. The main character is Twilight Sparkle, a scholarly unicorn given the task of studying the nature of friendship and reporting her findings to Equestria’s ruler. Said findings tend to arrive after twenty minutes’ worth of adventure and/or wacky hijinks. The only other show I can recall that successfully employed a moral-lesson-per-episode formula was Doug, an only-slightly-surreal cartoon concerning the adventures and tribulations of an average 11½-year-old boy. Surprisingly watchable due to the fact that it never felt like being lectured, it was also notable for featuring daydreams that honestly seemed to reflect a preteen’s worries and fantasies. But while Doug was a hit with its target audience when it was on TV, I can’t see it being of any interest to an older audience. While MLP:FiM excels at telling stories which (seemingly) just so happen to tie in with a moral, Doug never managed to present itself as a show that was primarily plot: It always seemed to be moralization first, entertainment second. Bronies would find Doug too preachy, even though it’s pound-for-pound less so than MLP:FiM, because its texture is too close to that of one of Aesop’s Fables. Its characters were rather flat, as well: There was the standard issue best friend, love interest, bully, and wacky neighbor. In contrast, bronies are quick to praise MLP:FiM for its unorthodox group of protagonists. Here, the socially awkward bookworm is the main character, not the sidekick who is there to offer hints to the hero in their quest when the answer lies in some obscure legend. And one may be surprised to learn that the fashion-obsessed socialite with a Persian cat is not the bitchy girl who makes fun of the nice girls’ secondhand clothing, but is every bit as supportive and friendly as the others. Not necessarily. Perhaps so many twentysomethings enjoy MLP:FiM, not in spite of its genuine wholesomeness, but because of it. It’s true that our generation has been raised on TV shows that rarely end on an iris out while everyone onscreen is laughing. Judging by our taste in comedy, we prefer humor rooted in darkness. In one of our most fondly remembered sitcoms, Arrested Development, the central theme seems to echo the beleaguered straight man’s insistence of the importance of family. But the family in question is in financial ruin due to the betrayal of one or more of its own members, who also include a shallow housewife who needs constant reassurance of her desirability, a thoughtless hothead with delusions of grandeur, and a man-child grappling with an Oedipal complex. In the same tone, Curb Your Enthusiasm has its would-be hero being the perpetual victim of endless misfortunes and miscommunication, and is only likable because it’s impossible not to pity him. While the cast predictably mock the stuffy atmosphere of forced pleasantries and stilted conversation (“Emotions are for ethnic people”), a good portion of the quips are dedicated to twisting the wholesome family values enshrined by the short. References are made to the father disowning his children and the mother’s affair with the postman, as well as noting the unintended connotations of the description of the manner in which the teenage boy seats his mother at the table. Besides poking fun at the short, MST3K corrupts it and what it stood for. Much humor, it felt, was to be found in darkness, so much so that audiences may have gotten the feeling that such darkness is necessary to be truly funny. If something was appropriate for a kid’s joke book, there was a limit to how funny it could be. And didn’t it seem like there’s a finite amount of jokes concerning the incompetence of public officials or the unscrupulousness of lawyers? Generation Y’s entertainment fostered the mindset that humor was directly correlated with cynicism, something that was challenged with My Little Pony: Friendship is Magic. In another episode, the aforementioned fashionista pony escapes her predicament by guilt-tripping the antagonists who kidnapped her into releasing her, providing the episode’s lesson of “Sometimes your friends can take care of themselves” with a tongue-in-cheek example of them “taking care of” a problem by being manipulative. But while the writers clearly enjoy pushing the envelope, the less-than-savory elements never threaten to corrode the show’s moral infrastructure. MLP:FiM‘s overarching tone and theme of genuine friendship are never compromised. The characters are genuinely friends with each other, with no façades of good graces to curry favor. And when a friendship is threatened, it is always mended by episode’s end, usually in tandem with the episode’s moral. The sly winks to mature audiences only comprise the frosting on the cake for bronies; their true devotion is to the show’s earnest nature. After wading through the grizzled, gnarled humor of contemporary TV, not to mention dramas striving for the grittiest of realism, it’s refreshing to cleanse oneself with the unironic good cheer that MLP:FiM has to offer. It must be comforting and invigorating for bronies to realize their souls haven’t been calcified by years of dark entertainment, and they can still enjoy a show intended for the very young. They still enjoy the other, disturbing TV, of course, but it’s nice to have MLP:FiM on hand to cleanse the palate. Soon a season finale will air, a two-part episode dealing with a wedding between two characters who haven’t even been mentioned thus far. It seems doubtful that the bronies will revere it as highly as the previous two-parter, which featured a villain inspired by a trickster archetype character from Star Trek: The Next Generation and voiced by the same actor. But if MLP:FiM has demonstrated anything, it’s the ability to find fans and praise in unlikely places. 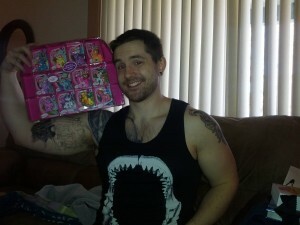 Image of what a typical brony might look like courtesy of Redditor ZachGates. This entry was posted in Entertainment, My Little Pony on 2012-04-19 23:55:48 by Pete.